Another recently finished project of mine, and also another test knit is my Colosseo cowl. (Diva cat strikes again). Good friend Christine asked if I would test knit for her and after learning the pattern was both brioche rib and moebius I was really keen. I've never knit moebius before so was keen to give it a try. And what a try it was!! 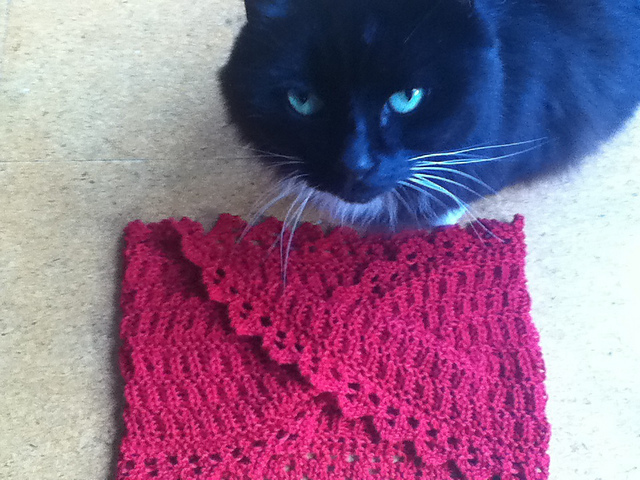 The pattern includes a link to a Cat Bordhi youtube clip which walks you through the cast on (not just a simple twist before joining in the round). I needed this walk through about 3 times before I finally got something knittable. It was well worth the effort to get it right though - what a strange (and kind of complicated) beginning but a really fun and enjoyable way to knit. It's amazing watching your knitting grow from the middle and seeing yourself go round in a sort of circle, but not. Very cool! The pattern produces a lovely cowl with interesting stitch definition and an easy to knit lace border that is also knit on. Well Done Christine!! There are some gorgeous FO's in the Ravelry gallery. I made mine in a bamboo/wool blend which wasn't a particularly good choice - too much drape and I had to go down a needle size to get a gauge that looked OK. A pure wool - something that blooms when you block it - would have been better. I wasn't that thrilled with the fabric but a visiting friend loved it so it went to a new home - nothing more satisfying than seeing one of your hand knits worn every day :) She loves it so I am happy. Sometimes knitting something is about the product and sometimes it is about the process. This was definitely a process knit for me - I learnt how to do a fabulous new moebius cast on, had a go a brioche rib, and learnt a valuable lesson about drape and yarn choice. The pattern is for sale and you can find the pattern page here.